Yep, you read that right. You HAVE to try these - YUMMY! Preheat oven to 375 degrees. Lightly oil baking sheets with olive oil. Place chocolate in microwavable bowl on high for 2 minutes, stirring once halfway through. Set aside to cool. Using an electric mixer on high speed, beat egg whites until soft peaks are formed. Gradually beat in 1 cup sucanat and continue beating until mixture is creamy. Add vanilla. In a small separate bowl combine remaining ½ c. sucanat, cocoa and arrowroot powder. Beat into egg whites on low speed. Stir in warm chocolate and continue stirring until mixture thickens. Place by rounded Tbsp onto 2 prepared baking sheets and bake for 10 minutes. Cool for 10 minutes on baking sheets before transferring to racks to cool completely. 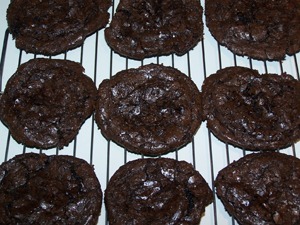 Note: Use parchment paper on a cookie sheet for baking these cookies.